Many of the fascinating Branson outdoors can be found on the lakeside of Table Rock Lake. With so many exciting water activities and thrilling adventures that you can enjoy at Table Rock Lake, you will be able to see countless of Branson outdoors around the lake. One example to enjoy water sports adventures on the lake is to take a dive experience with Diventures at State Park Marina. 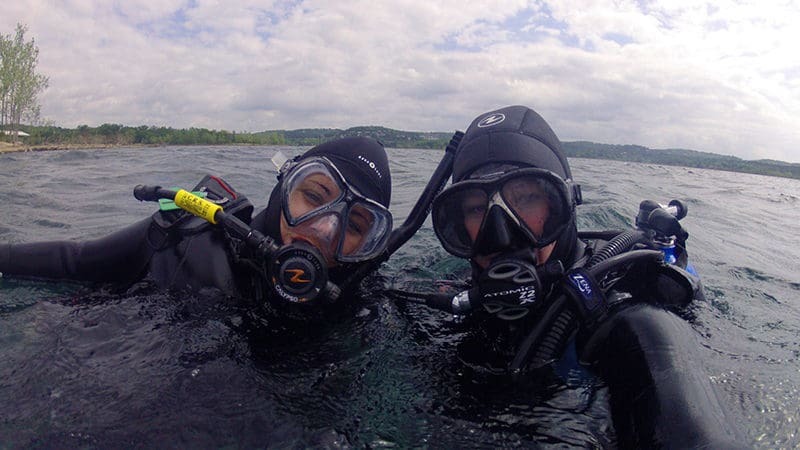 A team of swimming and scuba enthusiasts saw a need for specialized swim and scuba training and resources in the Midwest and they founded Diventures in 2009. Since its inception, Diventures have expanded to multiple locations, bring personalized, concierge service and training to swimmers and divers. Following the opening of the fourth location of Diventures at Table Rock Lake, the dive shop was opened with the marina and focused on boat diving on the lake, scuba training, service, rental and other thrilling water adventures. Diventures offer scuba training which includes independent training online and open water activity from the boat at the lake. The facility of Diventures has great features of dive boat, 500-square-foot store, top brand scuba gear and apparel, training center, travel center, service center, and regional lake diving. The location of the diving water adventures with Diventures is at Table Rock Lake with Trip Leader Aaron Parson and the Diventures boat crew from State Park Marina. The lake has many interesting dive sites and offers above average water conditions and has a very good lake visibility by lake standards throughout the summer. If you think scuba is for you but not ready to have a full certification, a Try Scuba class is the perfect introduction to let you experience the fascinating underwater world. The friendly staff of Diventures will ensure you to enjoy the fun on the water while remaining safe. The duration of this diving class is two hours. The class will start with a brief classroom session covering all of the basics, then hop into the warm 88º indoor pool. All the necessary equipments are provided during the training. The diving course is available only to 10 years old and above. If you want to brush up your diving skills, take Scuba Refresher course. If you haven’t donned your scuba gear for over a year, Scuba Refresher is perfect for you. With the Diventures’ comfortable 88º indoor pool and a depth of 14 feet, it’s perfect for brushing up on your diving skills. One of the highly trained dive professionals will show you the assembling and disassembling the gear that you will use, how to apply buoyancy skills, and how to respond on emergency situation. The course has a duration of three hours, one spent in the classroom reviewing about dive planning, dive tables, and dive execution. The remaining two hours allow you to refresh your skills in the pool. The scuba diving adventure that you want to experience with Diventures at Table Rock Lake will let you see countless of Branson outdoors as you explore the lake.